Summary: This NWP monograph provides an in-depth look at the longstanding New York City WP program of school-based professional development partnerships with the New York City public schools. Former NYCWP Director Marcie Wolfe provides background information on the development and evolution of the program which places TCs on-site at partner schools for multi-year cycles. 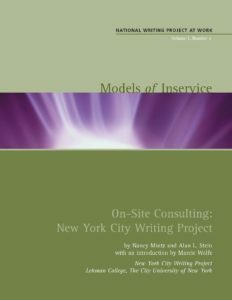 Two TCs with extensive experience in the on-site consultant role, Nancy Mintz and Alan Stein, then share their experiences. Mintz explores a fundamental consulting/coaching dilemma: how do you hold onto your core beliefs and values, while not trying to enact those beliefs and visions in someone else’s classroom. Stein’s story describes a crucial shift in school culture and the importance of the collaboration between himself, the principal, and several key teachers at the school. This thoughtful, extensive exploration of work in and with schools serves as a valuable resource for any leadership team considering extended professional development partnerships. direct work with the schools’ administrators, focused on their educational goals.